This movie came out 5 years ago, so obviously I'm a bit late on this one. Back in 2013, I wasn't entirely committed to the Marvel Cinematic Universe. I would see the movies if they were convenient, but I would just as happily not see them. For the past couple years I had bad luck. I would always turn the TV on right in the middle of this movie, or right when it was ending. But then, this morning, I was flipping channels, and I caught this movie right at the beginning. So I watched it, and here I am with my review. 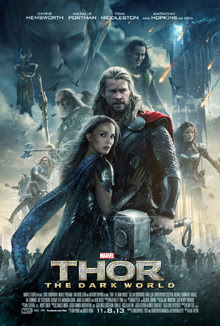 * The coolest thing about these Thor movies is how they blend Norse mythology with comic books. The 9 Realms. The Rainbow Bridge. Vanaheimir. The Dark Elves. When I'm watching these Thor movies, I keep thinking: "What kind of whacked out comic book writing is this?" Only to go to Wikipedia, and discover that most of this comes directly from the original Norse Mythology. I'm given to understand this was how Jack Kirby wrote the original comics way back in the 1960s, although--comic book geek though I am--I'm not well read in my Thor. * The interaction between Thor and Loki was good. * In retrospect, you can see that even back in 2013 they were setting up a lot of the pieces for Infinity War. It's kind of cool how intricately they had this all planned out. * Asgard was really visually appealing, but the dark world was really boring visually. * The villains were really boring. * I really liked Thor's three Warrior friends from the first movie. They were played by delightfully quirky character-actors. Plus I liked the idea of Thor having friends and teammates on Asgard, instead of just being a weird loner. * Natalie Portman wasn't really interesting in this movie. You know, we had had so many really great Marvel movies lately, that I kind of forgot there was a period during phase 1 and phase 2 where a lot of these movies were pretty much just place-holders between the big event team-up movies. But yeah, let's face it, some of these phase 2 movies were pretty forgettable. This movie isn't bad. It's competently done, and has a couple decent action scenes. But it's not great either. It's pretty meh. The craziness of Asgard is under-utilized, and the new Dark World is just really boring.